Plumbers and electricians are not the only kinds of contractors fighting for market share. There are also painters, housekeepers, carpet cleaners, window cleaners, and many more. You’ve Got Maids professional maid services wanted a way to get their name in front of prospective customers at all hours of the day and night. 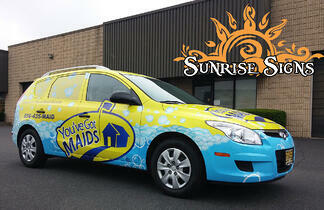 So, they contacted our friendly professionals for cleaning contractor vehicle wraps for South Jersey.